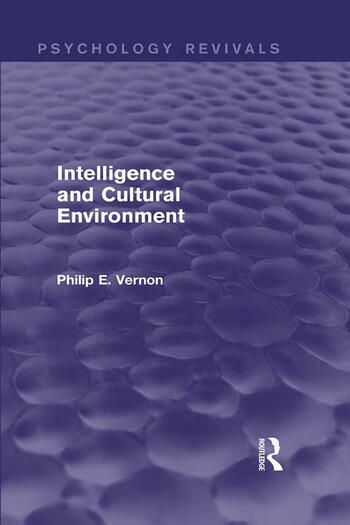 Originally published in 1969, Intelligence and Cultural Environment looks at the concept of intelligence and the factors influencing the mental development of children, including health and nutrition, as well as child-rearing practices. It goes on to discuss the application of intelligence tests in non-Western countries and includes both British and cross-cultural studies to illustrate this. Inevitably a product of the time in which it was written, this book nonetheless makes a valuable contribution to intelligence theory as we know it today. Part 1: Current Conceptions of Intelligence 1 Introduction 2 Intelligence A, B and C 3 Cognitive and Intellectual Growth 4 Factorial Conceptions of Intelligence 5 What is Potentiality? Part 2: Factors Influencing the Mental Development of Children 6 Nutritional and Health Conditions 7 Sensory-motor and Perceptual Factors 8 Language 9 Child-rearing Practices and Parental Attitudes 10 Studies of Intelligence, Achievement and Environment in Britain 11 American Studies, Particularly of Negroes 12 Some Effects of Schooling and Age 13 Types of Social Structure and Values Part 3: The Application of Tests in Non-Western Cultures 14 General Principles 15 Extrinsic Factors in Test Performance 16 Practical Conclusions Part 4: Studies in Britain 17 The Tests 18 What the Tests Measure 19 The Influence of Background and Personality Factors on the Scores of English Boys 20 Testing in the Hebrides Part 5: Cross-Cultural Studies 21 Jamaica 22 Main Investigation in Jamaica 23 East African Culture and Education 24 Testing on Ugandan Boys 25 Canadian Indians and Eskimos 26 Background Data on Indian and Eskimo Boys 27 Indians and Eskimos: Test Results Part 6: Summary and Implications Summary and Implications. Appendix F. Statistical Tables. Bibliography. Author Index. Subject Index.